The River Finn and its tributaries have for generations held an enviable position as one of the most prolific salmon fisheries in Europe. While other rivers build their reputations on either their spring salmon run or their summer grilse run, the Finn is almost unique in hosting a steady run of fish from before opening day on March 1st until well after the last day of the season on September 15th. 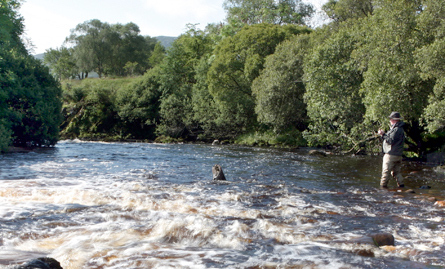 The medium-sized, grade 1 listed spate salmon river runs east through central Donegal from the Blue Stack Mountains, joining the tidal River Foyle at the border town of Lifford. Scientific estimations put the annual Foyle system salmon run at approximately 60,000 fish, with the Finn claiming almost 20% of the total. 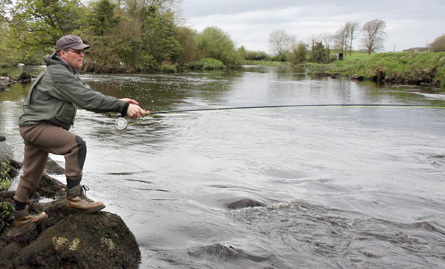 Recent legislation banning drift net fishing around Ireland’s coast is expected to lead to a significant increase in the numbers of fish returning to the rivers. The lodge is a beautifully finished and furnished house offering the highest standard of accommodation, comfort and cuisine. The newly-built lodge caters for up to eight guests in five bedrooms, three double (two with ensuite bathrooms) and two twin rooms. 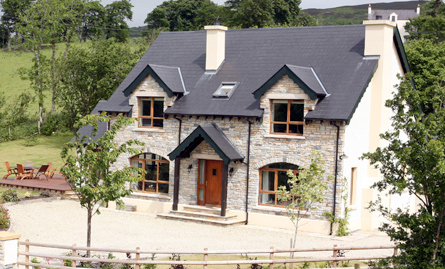 The two front bedrooms have a view of the river, which is only 80 metres away. The spacious downstairs accommodation comprises an open-plan kitchen, dining-room and living-room. A separate antique-filled drawing-room allows guests to relax in front of the peat-burning stove with a whiskey, wine or Irish coffee, while reading fishing and shooting books from the bookcase. A detached rod/gun room is used to get kitted up for the day’s sport and for waders and clothes to dry off in preparation for the following day. The room is equipped with rod and gun racks. There is ample parking, helicopter landing, laundry and freezer facilities and a safe for use by our guests.